1. _______________________ Though top most IT giants hire employees from India every year, this is not enough; our government should use the potential of its vast and diverse young demography on various sectors like agriculture, construction, entrepreneurship etc. It is well-known fact that the employment generated through IT is almost equal to the loss of employment due to IT and automation. A) Unemployment in India is a myth. B) Employment in India is on a rise since most of its work-force is aware IT and automation. C) IT industries are helping Indians to get better employment. D) Employment in India is in a boom due to its IT industries. E) Employment generation in India has been sluggish for almost a decade after the IT boom period. 2. The popularity of fictional stories without moral values is a recent problem of our education policy ________________________ lest children should confront the brutal facts of our society too early. Our education policy must come with a realistic and innovative policy to overcome this issue. A) Children should be taught moral values directly not through fiction and fables. C) A fictional story or fable cannot teach morality. D) Children should be left to themselves to judge moral values according to situation. E) Morality is a lesson to be taught at higher studies. A) Who has induced this growth in the national character or infect it with germs of decay? B) Who has induced this growth in the national character or infected it with germs of decay? C) Who has been induced this growth in the national character or infected it with germs of decay? D) Who induced this growth in the national character or infected it with germs of decay? 4. Many Countries have an individualistic orientation, with values, independence and self-assertiveness. ___________________________. They stress the interdependence of people within the community. A) There is no internal evidence for suggest this. B) Individuals in collectivist Asian cultures is even less likely to commit such errors. C) In contrast, many non-Western cultures have a more collectivist orientation. D) This is why Americans tends to use psychological traits to describe themselves. E) Actually, situational factors also play quite a important role. 5. Figurative and allegorical writings may be troublesome when target audience of the writer is vast and diverse. ___________________________ That’s why these types of writing are scarcely followed in media or in any other public domain. So is the case of satirical writing. B) It’s very complicated and use of archaic words make it more complicated. C) People find it boring and philosophical. D) It’s too much poetic and literary. E) These are old fashioned. Directions (6 – 10): For the following word given below, a contextual usage is provided. Pick the word from the alternatives given that is most inappropriate in the given context. 6. Abashed: Ronit’s uncivilized behavior in the company function abashed his parents and his relatives. 7. Abate: After the heavy rains for the last two weeks, the flood has abated to the safe level. 8. Abbreviate: UN is the abbreviated form of United Nations organization. 9. Abduct: The group, which abducted a girl from the school demands ransom to release the girl. 10. Aberration: An aberration in one’s behavior is very common and is unavoidable for many of us. 1. E) By reading the last three lines we can clearly see that it is depicting a dismal picture about the employment problem in India and comparing IT related jobs with overall job-creation sectors. So, option (a), (b), (c) & (d) can directly be cancelled out. Option E is the correct answer and is a suitable introductory sentence for the paragraph. 2. B) A conditional clause “lest…….should” is used here. ‘Lest’ generally means ‘in case’. According to general idea of the topic, we must say that moral cannot be directly taught to children but with the help of fables and fiction. Option (a) and (c) is therefore irrelevant according to the paragraph. Option (d) and (e) are grammatically incorrect. Hence, Option (b) is the correct answer. 3. B) The general idea of this topic is the corruption in our political system. Last sentence is talking about people who are corrupting our whole society. By clear observation, we can notice that the line is in ‘passive’ and ‘interrogative’ form. So, option (a) is incorrect because second verb ‘infect’ is not in participle form. In (c) & (d), auxiliary verb is missing . So, option (b) is correct. 4. C) Except sentence c) all the sentences are grammatically incorrect. Also, sentence C aptly shows a contrast in the given context. 5. A) By observing the first and third sentence we can deduce that the second sentence must state the reason for the first line . This is further clarified in the third sentence by using ‘that’s why’. Option A will be correct because when an idea leads to more than one interpretations it became chaos and is not followed on public domain. Hence, Option A is the most suitable answer. 6. E) Abashed means make (someone) feel embarrassed, disconcerted, or ashamed. So the most inappropriate option is ‘recuperate’ means ‘to recover from illness as all the rest gives a similar meaning to ‘abashed’ Thus option E is the correct answer. 7. D) The word abate means ‘make (something) less intense or to reduce’ So the most inappropriate option is ‘augment’ which gives an opposite meaning i.e. ‘make (something) greater by adding to it; increase.’ Thus option D is the correct answer. 8. 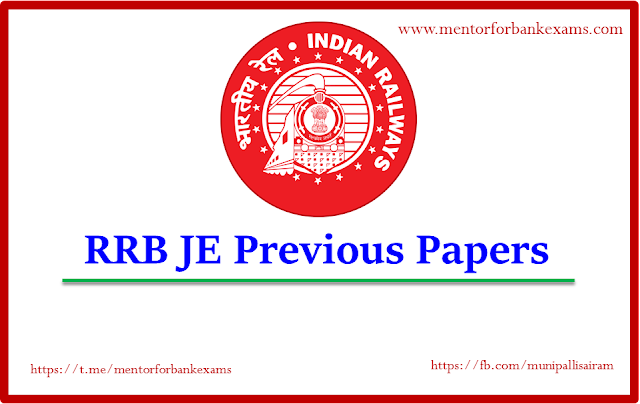 E) The word abbreviate means short form of something So the most inappropriate word here is ‘Rejig’ means ‘to keep in order or rearrange’ The other options are synonymous to Abbreviate. Thus option E is the correct answer. 9. E) The word ‘abduct’ means to kidnap. So the best option here is ‘ameliorate’ means ‘to make something bad, better’ The others are synonymous to ‘abduct’ Thus option E is the correct answer. 10. E) The word ‘aberration’ means ‘a shift or deviation from the usual’ So the best option is ‘Pragmatic’ means ‘dealing with things sensibly and realistically in a way that is based on practical rather than theoretical considerations.’ Thus option E is the correct answer. 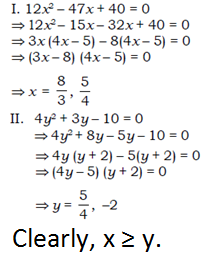 Direction (1 – 5): Study the following line graphs carefully and answer the given questions. 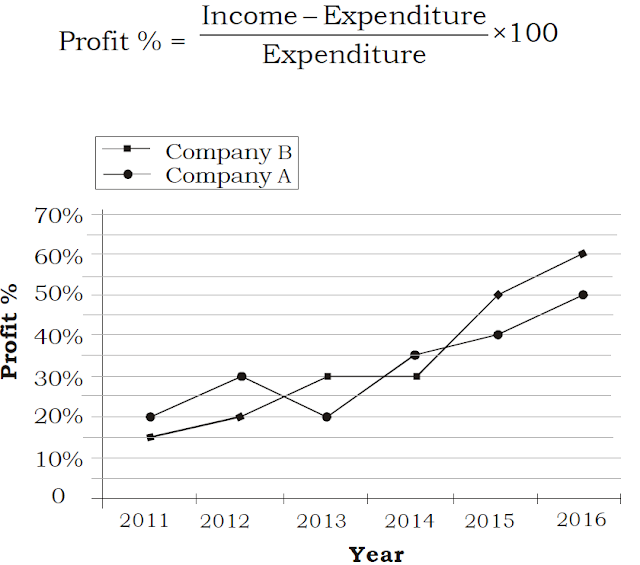 Line graph shows the profit percent earned by two companies A and B over the given years. 1. If the income of Company A in the year 2012 was equal to the expenditure of Company B in the year 2015, then what was the ratio of their respective profits? 2. If the income of Company A in the year 2015 was equal to its expenditure in the year 2016, then what was the ratio of its respective incomes in these two years? 3. For Company B, in which year is the percent of increase in percent profit over that of previous year the highest? 4. If the expenditure of Company A in the year 2011 was Rs.40 crores, then what was its income in that year? 5. What was the difference in the expenditures of these two Companies in the year 2013? 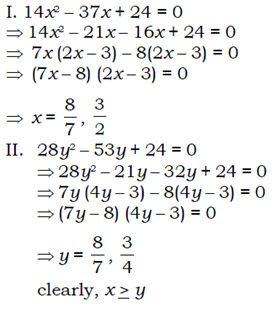 Directions (1 – 4): Study the following information carefully to answer the given questions. Step VI is the last step of the above input. As per the rules followed in the above steps, find out in each of the following questions the steps for the input given below. 2. Which of the following elements will be the 7th element from right in Step V? 4. In step V of rearrangement, if ‘attack’ is related to ‘grapes’ in a certain way and ‘98’ is related to ‘ 19’ in the same way, which of the following would ‘above’ be related to following the same way? 5. Six friends P, Q, R, S, T, and U are sitting around a circular table facing towards centre. 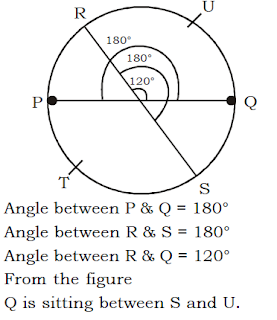 The angle made at the centre of the circle by a straight lines from P and Q is 180°, from Q and R is 120°, from R and S 180°. 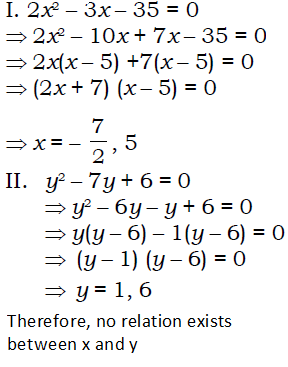 T is not sitting on the immediate left of R while R is not on the immediate right of P. On the basis of the above information which of the line following statements is definitely true ? A) R is sitting between P and S.
B) T is sitting between P and U. C) Q is sitting between S and U. D) T and R are sitting opposite each other. 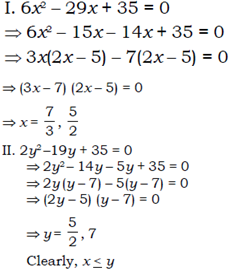 Directions (6 – 10): Read the following information and answer the questions given below. There are eight people namely Ajay, Bipin, Chintu, Dipesh, Edward, Faisal, Guddu and Harsh who sit around a circular table facing towards or away from the centre. They like different ice cream flavours. One of the flavours is Strawberry. 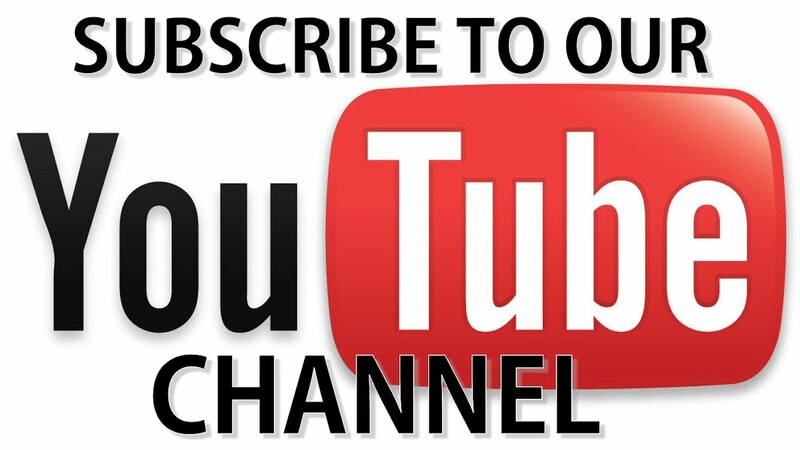 The following information is known about them. Harsh's neighbours face in same direction but opposite to that of Harsh. Guddu sits third to the left of Edward who faces towards the centre. Dipesh's spouse who likes Chocolate flavour sits third to the left of Dipesh's. Chintu sits third to the right of a male and they face in the same direction. Bipin's immediate neighbours face in same direction but opposite to that of Bipin. The female who likes Vanilla flavour sits opposite to the male who likes Red Velvet. Ajay who likes Black Current flavour sits second to the left of Dipesh's and they face in the same direction. 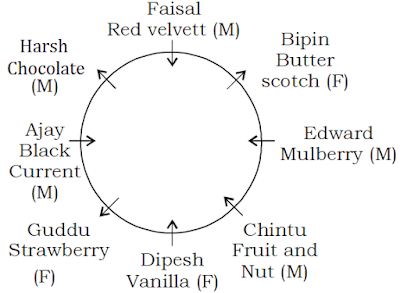 The immediate neighbours of Chintu like Vanilla and Mulberry flavours. Bipin and Faisal sit together and none of them sits with Ajay and Dipesh's. Guddu's spouse who likes Fruit and Nut flavour sits second to the left of Guddu. The immediate neighbours of Harsh's only sister who is neither Chintu nor Edward are Ajay and Dipesh. Bipin who likes Butter Scotch flavour is the only one who's both the immediate neighbours are of opposite gender to Bipin. 6. Who among the following is an immediate neighbour of the one who likes chocolate? 7. How many people face away from the centers? 8. How many males are there? 9. Who likes strawberry flavour? 10. Who sits opposite to the one who likes Mulberry? The words are arranged on the left and the numbers on the right in each step one by one. As for words, the ones starting with vowels are arranged in alphabetical order followed by the ones starting with consonants. In the case of numbers, first odd numbers are arranged in ascending order and then even numbers.